Extreame Savings Item! Save 45% on the Homyl Powerful Push Pull Type DC 220V frame Type DC electromagnet 34.5mm 20N 2KG for Office Facility Household Appliance, Mechanical by Homyl at N Online Agency. MPN: 095aa1f963d639be12e46e3496d11fc3. Hurry! Limited time offer. Offer valid only while supplies last. 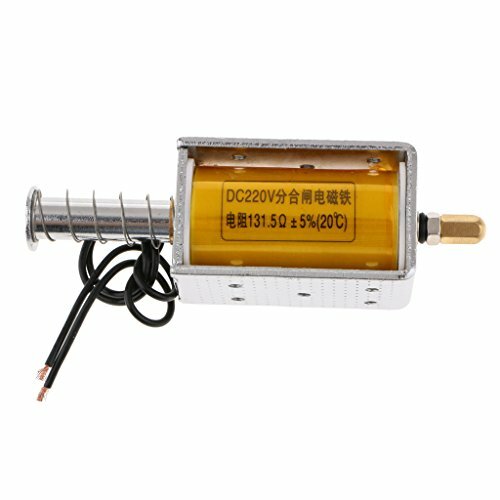 Description: - DC solenoid electromagnet mainly used in vending machines, transport equipment, office facility household appliance, mechanical, etc. - DC solenoid electromagnet mainly used in vending machines, transport equipment, office facility household appliance, mechanical, etc. - When energized, doing work through pulling in plunger joined object. - With a full copper coil, the power supply efficiency is better. - Fine manufacturing process, reliable performance and long service life. This product is a momentary working product. It can't be powered for too long (about 5 seconds), otherwise it will burn out immediately. Because the current is too large, please pay attention to the appropriate power supply when using it. Otherwise, the electromagnet will not work properly. Fine manufacturing process, reliable performance and long service life. With a full copper coil, the power supply efficiency is better.